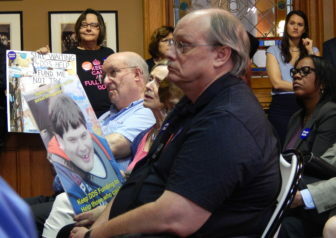 Families of people with intellectual or developmental disabilities are urging lawmakers to enact the budget as is, fearing that any changes could lead to more cuts to services for their loved ones. To offset new taxes that have rankled business groups, Gov. Dannel P. Malloy proposed trimming up to 1.5 percent of discretionary spending in the new state budget. But the administration’s proposal shows the bulk of the cuts would be likely to fall on education, municipal aid, health care and social services. And a key legislator has warned that most of those areas could face even deeper cuts once the new fiscal year is underway. That’s because the new budget relies much more heavily than past budgets on undefined savings — making it likely that the governor will need to order midyear cuts. At issue is how state leaders would come up with spending cuts to match tax reductions Malloy is seeking in the budget, which passed the House and Senate June 3 but has not yet been signed by the governor. Malloy’s budget director, Benjamin Barnes, said Thursday that the exact method for determining what gets cut hasn’t yet been determined — including whether the administration would prefer to have the authority to make reductions or accept a package of cuts from legislators. But Barnes said the administration would want to ensure that any cuts don’t affect payments the state must legally make, such as debt service. An analysis of the administration’s proposal indicates that 47 percent of the budget — nearly $9 billion out of $18.1 billion in the first year – would be off-the-table for spending cuts. Those include spending on state employee salaries and benefits, debt service, and funding for magnet schools. In the current fiscal year, personnel costs account for nearly 38 percent of state spending, while debt service makes up another 10 percent. Instead, the $224 million in two-year savings Malloy is seeking would come from the rest of the budget, with the largest potential hits to areas including colleges and universities, grants to local school districts, mental health care, social services, Medicaid and programs for people with intellectual or developmental disabilities. A 1.5 percent cut to Medicaid, one of the largest parts of the budget, would require saving $37 million, while Education Cost Sharing grants for local schools could be cut by as much as $32.3 million. Not every line item identified by the administration for potential cuts would need to be reduced by 1.5 percent to achieve the savings necessary to roll back the controversial business taxes. While business groups have been seeking the reversal of plans to increase certain corporate taxes and institute new ones, human service providers and advocates have been pushing state leaders to keep the budget as is, warning that human services are likely to bear the brunt of any cuts. They point to the budget Malloy proposed in February, which called for deep cuts to social services, including programs for people with intellectual and developmental disabilities, as well as Malloy’s previous mid-year cuts, known as rescissions. “The budget that was presented in February, I believe, gives us a roadmap about how the governor would potentially exercise rescission authority, and that cuts deep into the human service infrastructure,” Heather Gates, executive director of the mental health agency Community Health Resources, said during a press conference this week. While the immediate cuts being discussed would not exceed 1.5 percent for any budget item, once the fiscal year begins, Malloy would have authority to cut up to 5 percent of many line items to address midyear budget shortfalls. While all budgets include certain savings targets — known as lapses — that the governor must hit, the new two-year budget raises those targets by 42 percent in the first year. It also relies on a controversial $325 million borrowing scheme that Treasurer Denise L. Nappier said probably could not be fully achieved. She estimates the state could fall $147 million short over the biennium. “We have some very aggressive lapses in the budget,” Sen. Beth Bye, D-West Hartford, co-chair of the Appropriations Committee, told the Mirror on Monday. The administration must find $188 million in general fund savings next fiscal year, up from $132 million this year. If Malloy can’t find the savings he needs through efficiencies, the governor could hit the target by using his authority to make midyear cuts, known as rescissions. “A cut of 1.5 percent could quickly become 6.5 percent,” Bye said. Past gubernatorial budget rescissions also have fallen most heavily on social services, health care and higher education, partly because of the budget expenses fixed by contractual obligations. Municipal aid also is exempt from rescissions. The governor also might need to impose more cuts if Nappier is correct about “bond premiums” – special proceeds the state receives as part of a complex process when borrowing funds for capital projects at a higher rate. Nappier warned in February, when Malloy unveiled his plan to use these premiums to help cover debt service costs in the new budget, that it could jeopardize Connecticut’s reputation on Wall Street. More importantly, Nappier said, with interest rates expected to rise over the next two years, it is unlikely investors would provide enough premiums to keep the new budget in balance. Although the budget legislators passed contains significant cuts to health care and social services, human service advocates have described it as far preferable to Malloy’s original proposal, and some expressed concern about what could happen if Malloy has authority to make additional cuts. Although an additional cut of up to 1.5 percent wouldn’t reach the levels of reductions Malloy initially proposed in most areas, advocates remain concerned. Heather Gates, executive director of the mental health agency Community Health Resources, speaking at a press conference in support of the budget as passed. Gates said her agency began making plans to close a clinic that serves 1,000 people and freeze admissions to outpatient clinics after Malloy’s initial proposal, but stopped after some funding was restored in the budget legislators approved. Now, with more cuts on the horizon, those plans are back on the table, she said. Asked about human service advocates’ concerns about cuts, Barnes noted that cutting the budget inevitably requires reductions to spending on programs that have supporters. But he said the budget provides “significant growth” in some human service areas. He cited community residential services for people with developmental disabilities, which would grow by 5 percent under the new budget — from $458.6 million per year to $483.9 million, although that figure is still below the $492.5 million that the state Department of Developmental Services requested for the upcoming fiscal year.